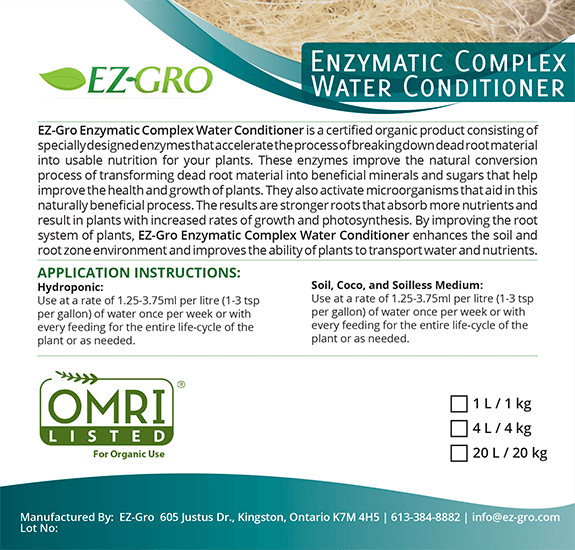 EZ-Gro Enzymatic Complex Water Conditioner is a certified organic product consisting of specially designed enzymes that accelerate the process of breaking down dead root material into usable nutrition for your plants. These enzymes improve the natural conversion process of transforming dead root material into beneficial minerals and sugars that help improve the health and growth of plants. They also activate microorganisms that aid in this naturally beneficial process. The results are stronger roots that absorb more nutrients and result in plants with increased rates of growth and photosynthesis. By improving the root system of plants, EZ-Gro Enzymatic Complex Water Conditioner enhances the soil and root zone environment and improves the ability of plants to transport water and nutrients. Use at a rate of 1.25-3.75ml per litre (1-3 tsp per gallon) of water once per week or with every feeding for the entire life-cycle of the plant or as needed. Use at a rate of 1.25-3.75ml per litre (1-3 tsp per gallon) of water twice per week for the entire life-cycle of the plant or as needed.